Education: especially the STEM as they impact the GDP (per capita) growth more than any other factor. The HDI, for instance, reflects the GDP per capita heavily as it reflects the human well-being (not including the environmental well-being). USL1 pushes the STEM education to an entirely higher levels which will radically alter the future of economic growths, which will impact the environment unless coordinated properly (which is why URF1 is proposed for the sustainable developments for all). The grim challenges, too high a cost: Economy and Environment have been antogonistic in the past and will continue being so unless we take a new course of global action. USL1-URF1 together are designed to help us achieve this not only by resolving both of the problems of Economy and Environment simultaneously as we are currently facing the top 5 global crises, but also push both of them to the new levels of sustainability very rapidly. The biggest trouble for this is that the total costs for resolving the top 5 global crises. averaging about 5x of the entire current world GDP (about 73 Trillion USD in 2015), averaging over 350 Trillion USD. So, the average nations on earth need to spend 7-20% of their GDPs annually over the next half a century. This is too high a price, too big a sacrifice, too long a time, for any country to resolve them all simultaneously. The resolutions from these seemingly unsurmountable impasses come from a surprising angle: U Trio (USL1, 5UE, and URF1). You can think of USL1 as a yang (man) and URF1 as a woman (woman). 5UE (5 Unified Es) is like a marriage between these two (the set of guiding principles between USL1 and URF1), keeping everything sustainable, pushing the marriage between Economy and Environment together to the next level. USL1 (Unified Super Learning version 1.0) will effectively take care of the economic part by colossally boosting the human capital, GDP growths, [and taming the population over-growth at the same time] – not at the expense of the environmental sacrifices – because after quick reforms, USL1 will induce the surplus cumulative world GDPs by 10x of the current world GDP after the first 2 decades alone and will continue its exponentially increase. 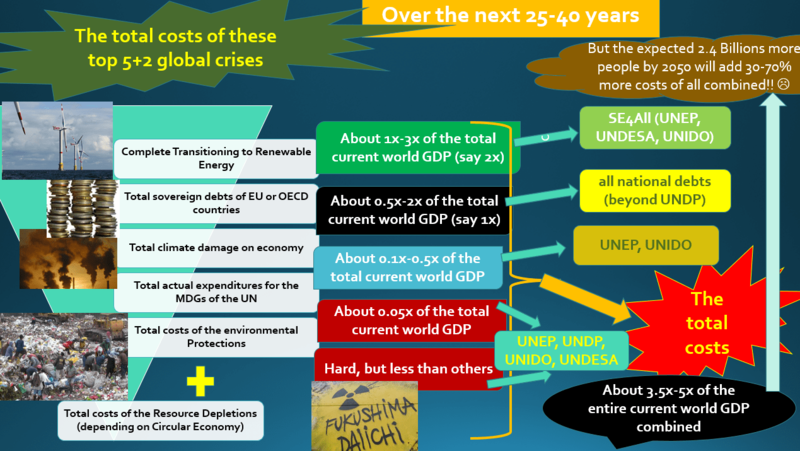 URF1 (Unified Redistribution Fund, which we try to establish as an international treaty via the UN) will assure that these cosmological, cumulative surplus GDPs are used for the benenefits of the world by protecting the environment and stablizing the social system, instead of antaognizing the environment unustainably further . The guiding principles behind the protocols of URF1 will be 5UEs, which is Unified 5 Es (Education, Economy, Energy, Environment, and Empowerment). Each of the 5 global crises corresponds to each of 5 Es. Halving the GDP doubling time (which induces the exponentially faster economic growths). The current world GDP of about 3.5% will take about 20 years to double, but USL1 can make it 10 years to double it. So, in 40 years (roughly the average career duration) instead of the current world GDP grows 4x, USL1-induced GDP will be 16x. 2x-3x the Population Growth Doubling time (which exponentially reduces the population growths): the largest population growth contributor currently is the sub-Saharan Africa growing about 2.7% annually (and will double in about 25 years), but with the USL1 contributions to the GDP per captita growth, the doubling time will be roughly 50-75 years afterwards, which is equivalent to about 1% population growth, which is about 1-1.4% annual growth rate of the world average reduction. So, USL1 can bring down the population growth rate of sub-Saharan Africa effectively to around world average. The enhanced GDP per capita : as USL1 boosts the GDP per capita by about 2% for a fixed population more or less while USL1 will reduce the population growths significantly. For the LDCs (least developed countries) with the highest population growths and poverty, especially for SSA (sub-Saharan Africa) and SA (South Asia) after the rapid reforms of USL1 (within 5 years), the USL1-induced GDP per capita boosts especially for will be about 3-5% (2% up for the GDP, 1-3% surplus for rapidly reducing the population growth rates on the denominator) as GDP per Capita is usually used as the measure of the human happiness or well-being and a key factor of HDI (Human Development Index). For the developing countries or the OECD countries, the GDP per capita surplus may be between 2-3%. governments join it with the UN to resolve all top 5 crises (of Sovereign Debts, Energy depletion, Environment, Overpopulation growth & Poverty) simultaneously using these USL-induced surpluses, instead of stagnating with these crises. OVERPOPULATION NOTE: between 2015-2050 (during 35 years), the world population will increase from 7.2 to 9.6 Billions people (2.4 Billions of increase) according to a UN report. This is equivalent to add 1/3 of the new population in just 35 years. This alone will have the huge impacts to the rest of these top crises (environment, resource, food, equality, economy, and empowerment, etc.) we are facing. USL 1.0 alone, however, (if the UN, NGOs, and governments collaborate) can reduce the growth by 1-1.5 Billions, which is like adding 1/7 of the current world population, not 1/3. Moreover, for the extra 20 years, we can reduce the population over-growths further of course. This seemingly complex-looking USL-5UEs-URF Trio hinges on 3 central pieces: USL (Human Capital breakthroughs to radically transform both the face of STEM education & world economy completely), 5UEs (the guiding principles for USL not to abuse the new breakthroughs for profits & uncontrolled growths, but to benefit everything simultaneously sustainably), and URF (law and financing for the world so that things can actually work instead of daydreaming). 5UEs (Unified 5Es) where these 5 Es are Education (USL1-triggered STEM subjects breakthroughs) –> Economy (Circular and Green Economy) –> Energy (Renewable) –> Environment (ranging from Amazon forests or Climate anomalies or plastics to the Fukushima aftermaths, etc.) –> Equality/Empowerment (for the various socio-economic & overpopulation crises). The 5UEs are the guiding principle/visions of USL to rapidly transform our world for much better within 10-20 years, not 50-100+ years. URF (Unified Redistribution Funds): we try to create a UN-led binding international treaty in such a way that the staggering GDP boosts using USL1 can be used as the motives or even baits for all the governments and NGOs to join the international treaty and set up protocols to help us thrive sustainably not at the exclusion of the rest, but all together with the strict check and balance. Due to the colossal economic gains associated with the USL x.x series, the governments have to respect the protocols because the more they violated, the more difficult for them to access for the next versions of USL with the increasingly higher costs. This is designed in such a way that everyone prosper together helping one another. Otherwise, those who violate will become obsolete within a decade from the rest of the world. You can think of the trio operations are like socio-economic-environmental karma system because the nations will get exactly what they deserve for the better or worse, just like the Nature. Please click HERE to go to our USL website.